Some of my favorite parts of this book take place while Avery and Bett were at camp. I didn't get to attend camp when I was a kid, but I did get to be a program director at my local Girl Scout camp, Camp Oak Spring. One thing my campers LOVED was singing camp songs, and there were tons of fun ones out there. These are some of the ones me and my daughter remember fondly from our time at camp. be sure to stop by and see which camp songs my "pen pal" Kendra is sharing today over at That Reader Girl. I am a HUGE fan of Wolitzer's work. I have read, and adored, many of her adult and YA books. There is just something about camp books that delights me. There is a Parent Trap like storyline in there, and that's a film I will always love. Well, I am happy to report, that the above mentioned things contributed to a wonderful reading experience, but there was so much more to this novel than what I listed. I am going to admit, it was insta-love for me. I was smitten with Avery and Bett from their very first exchange. Bett's larger than life personality and tell-it-like-it-is philosophy made me smile, and Avery being so straight-laced and grounded was the perfect foil for her. The early letters between the two were filled with fun facts and some plotting, but you could also see Bett and Avery discovering some commonalities and a friendship slowly emerging. In addition to seeing their friendship grow and flourish, I also saw the girls grow and flourish. This book took place over two years time, and I saw Bett and Avery mature physically, mentally, and emotionally. I also loved the idea of family presented in this novel. Both Bett and Avery were being raised by single fathers, and though Avery knew her biological mother, Bett only knew of the surrogate who carried her. It's always lovely to see such diverse families in books. The authors also incorporated the idea of found-family, and I have to say, this "family" was filled with so much love and joy, it was really heartwarming to be around them. I wore a smile on my face from the beginning of this book to the very last page. This story was fun and sweet and touching and emphasized three really wonderful things: friends, family, and love. * ARC received in exchange for an honest review. Do you have a favorite camp song? 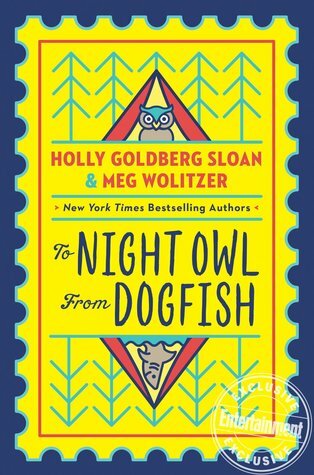 Night Owl and Dog Fish omg, the cuteness! There's so much to love about this book, but honestly that you read it with a smile on your face is what convinced me this is <3 -- some days that's exactly the sort of goodness you need to hear. I loved how honest the discourse between the girls was and friendship and family will always win my heart. This one seems to have so much going for it! I know a lot of people have issues with the epistolary format, but I usually love it. For some reason it just works for me. Your mention of The Parent Trap didn't hurt either. :) I grew up watching the Haley Mills version (I'm betting you did, too?) and the LL version isn't bad either. I like the way family is represented in a non-traditional form and overall it just sounds like such a feel-good story! These are letters between two 12-13 year old girls, that are so honest and fun. I loved it! There was a point where they talked about playing/singing their dads' favorite song, which totally screamed Parent Trap. Very fun, very sweet, and absolutely entertaining. Epistolary and Parent Trap? That sounds like a lot of fun! It was a tremendous amount of fun, and the authors touched upon social issues in such an organic way too, which is what I always love about middle grades books. It really did have all the right things, in the right proportions. It was my personal want, that kept me from giving 5-stars to this book, but it was near perfect. This sounds really cute! 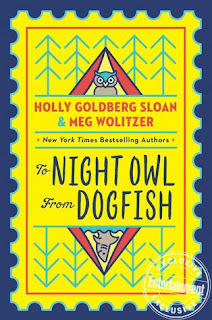 I've never read anything by the authors, but I love the sound of this camp adventure. Thanks for sharing! Wolitzer has written all over the age range, and her books are really thought provoking. This is my first read from Sloan, but I hope to read the book from my TBR by her soon. Great cover and title. I did enjoy some of those vids. Those were their code names while they were plotting. One had trouble sleeping, thus, she was Night Owl. The other loved dogs and the ocean and water sports, so she wanted to be a shark. Kookaburra was one we always sang, and I enjoyed I Caught a Little Baby bumblebee, though the adults thought we got a bit gross with this one (that just made it even better). We never sang those at camp, but I did sing them (often) with my daughter, because whatever Barney was singing was what we were singing. This sounds super cute. I had no idea Wolitzer had written anything middle grade, so you definitely have me curious now. I never got to go to camp when I was a kid either so I don't have a favorite camp song. I remember my son singing a few of these though. I am not sure if Wolitzer has any other MG, but this partnership produced a stupendous book. This sounds great, Sam! I love everything connected to camp and this sounds like it is really well done. I have a lot of memories connected to singing songs at camp. It was so fun, cute, humorous, heartwarming -- name good things and that's in this book. I have really loved all Wolitzer's books, and middle grades have been clicking with me lately. It was so fun and adorable and endearing and honest. I couldn't find anything NOT to love in this book. I got certified to take my troop camping and was so happy they didn't want to sleep outside (as they explained it to me). How adorable. I want to read this one. I loved camp when we went as a kid. Uhh the good old days.